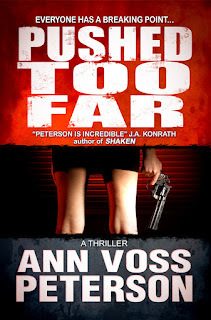 This is a guest post by my friend Ann Voss Peterson. But it's more than that. It's a call to arms, a cautionary tale, and a scathing exposé. Ann: In this world, there are a lot of things I can't afford to do. A trip around the world, for instance, although it would be amazing. Remodeling my kitchen. And until recently, sadly, braces for my son. There's one more thing that I find valuable and enjoyable that I can no longer afford to do, and that is write for Harlequin. I published my first novel with Harlequin's Intrigue line in August of 2000. My twenty-fifth was released in November, 2011. I had a lot of fun writing those books--taut, page-turning, action-packed romantic suspense staring a myriad of different heroes and heroines and a boatload of delicious villains. I had four editors during that time, and all of them were great to work with. The senior editor has a strong vision for the line, and that vision appeals to readers all over the world. My books were in bookstores and Target and WalMart, and my office overflows with foreign copies from countries I've never visited. I have around three million books in print, and Harlequin throws the best parties in all of publishing, hands down. But as lovely as all that is, I can't afford to write for them anymore. If you do a (very) little digging into publishing companies, you'll discover that while the industry standard royalty rate for mass market paperback sales is 8% for US retail, Harlequin pays its series authors only 6%. The royalty goes down from there. All Harlequin series authors know that US retail royalties are going to be lower than industry standard going in. We also know that Harlequin pays rather low advances. My largest and most current advance was only $6,500 per book, but here's the kicker; the books are widely distributedand sell a lot of copies. I have NEVER failed to earn out in my first royalty statement. That's right, ALL of my books have earned out and then some. So why can't I afford to write for them any longer? Let me share with you the numbers of a book I wrote that was first published in January, 2002, still one of my favorites. My life-to-date statement says this book has sold 179,057 copies so far, and it has earned $20,375.22. (bold text by Joe) That means the average I've earned is a whopping 11 cents per copy. If you use the cover price to calculate (the number used in the contract), which was $4.50 at the time of release, I've earned an AVERAGE of 2.4 % per copy. First, while most of my books are sold in the US, many are sold under lower royalty rates in other countries. In this particular contract, some foreign rights and -ALL ebook royalties- are figured in a way that artificially reduces net by licensing the book to a "related licensee," in other words, a company owned by Harlequin itself. Harlequin uses the Wholesale Model (not the Agency Model) with retailers, including Amazon. So the money Harlequin receives is determined by the list price, and retailers can set any price for the consumer that they want. This is how the numbers break down when Retailer X lists the ebook for $4.00 (doesn't matter what they sell it for). So Harlequin makes a total of 1.94, and I make .06. Six cents is 1.5% of the list price of $4.00. It is 7.7% of what most publishers define as net earnings, (in this example $1.94). To make things worse, the reversion clause is also onerous. It requires the book to be totally out of print everywhere in the world in every format for 5-7 years before an author can request reversion. After the request is made, Harlequin has another 18 months to release the book in any format anywhere in the world, and it gets to keep the rights. The book in my example is not eligible for reversion because it was issued as an ebook in Spain in 2009; a license which has earned me a total of 33 cents according to my most recent royalty statement. So why publish with Harlequin in the first place? In the past, Harlequin brought a lot of value to the table. Like I said at the beginning of this post, my books are in the big box stores. My books are published all over the world. Harlequin's paper distribution is valuable. Another value is the Harlequin brand, probably the only publisher that readers recognize and seek out. But distribution doesn't matter with ebooks. And while Harlequin does have its own community and ebook store, they have yet to show their brand sells ebooks. I have sixteen Intrigues available digitally, and my independently-published books consistently outsell all of them (a fact made even more dramatic if you figure out how many more Harlequins they would have to sell for me in order to equal the amount I make with the indie books). Harlequin has offered an amendment to the ebook clause of past contracts. It raises the ebook royalty to 20% of net for US, English language ebooks. However they refuse to define net in the contract, among other problems, making it impossible to determine whether the amendment is a better deal for the author or not, and as a result I have not signed. In the end, all these points make my business decision of choosing a publisher clear. The 70% and 35% rates offered by Amazon and others are a better deal than 6% of cover price, 2.4% of average cover-price-based earnings, 1.5% of cover price and even 7.7% of what most publishers define as net earnings. I might not sell 179,000 copies of a book, but in ten years (the length of time they've had that 2002 book, ACCESSORY TO MARRIAGE), that number is more than possible. And if you look at the money instead of the number of copies, I need only sell 10,000 copies of a $2.99 book to reach 20K. Now to be fair, I have many books I want to write that don't fit Harlequin's publishing program, like the CODENAME: CHANDLER stories I'm writing with Joe and my new solo novel PUSHED TOO FAR, which has some romantic elements but is a thriller. However I like writing romantic suspense, and when I write another, I won't send it to Intrigue, because now I have a choice. It comes down to a business decision. I can choose to write for Harlequin (high paper distribution/low royalty rates) or some other New York publisher (likely hit-or-miss paper distribution/slightly less low royalty rates)—or I can have my son's teeth straightened. For me, that choice is a no brainer. Joe sez: I met Ann a few years ago at a writing convention. She's a terrific writer, and has a better grasp of story structure than nearly anyone I've encountered in this business. The way she's been treated by Harlequin is disgusting. Even worse, it isn't just Ann being treated this way. Harlequin has been screwing romance writers for decades. Some of the most prolific authors on the planet write for Harlequin, and they're forced to be prolific because the only way to make a living is to pump out multiple books as fast as they can. Since discussing numbers with Ann years ago, I've been appalled by her tiny income versus her worldwide reach. She's outsold me in paper by at least a factor of 5 to 1. Yet there hasn't been a single year we've both been in the biz that I haven't earned at least triple what she has, while writing fewer books. Something that disgusts me even more, not only in Ann's case but in the case of all writers being bled by Harlequin's company store, is the fact that they can't get away. There have been some notable exceptions. Romance authors who managed to escape Harlequin's stranglehold and eventually become huge bestsellers. I'm friends with many of these ladies. While they admit they're doing much better financially with their current publishers, they each acknowledge a debt of gratitude to Harlequin for giving them their start. Sorry, but that's just awful. They were used and treated unfairly, and their books caught on so they were able to make the leap to higher royalties. But you really shouldn't thank the company that subjugated you. Naturally, Harlequin lauds these successes and rereleases these authors' old backlists (which it still controls) with new covers, confusing their new fans. Many readers have been burned thinking it is a new thriller release, only to find out it is a misleading repackaging of an old romance, which leads to one star reviews and hate email, and the authors can't do a thing about it. Nor can they get better royalty rates on these old titles, which are piggybacking off their recent successes. Harlequin wants all writers working for them to believe: "Someday, if I work hard, I'll be as big as (insert any Top 10 NYT bestseller here who once worked for Harlequin.)" But here's the kicker. In order to put food on the table, Ann and her peers have to turn out books quickly, leaving them ZERO TIME to write that standalone which could break them out. You load sixteen tons, and what do you get? Another day older and deeper in debt. Now, it took a great deal of guts for Ann to leave Harlequin and become a fulltime self-published author. It also took a lot of guts for her to write this guest blog at my request. But that's Ann. She has guts. 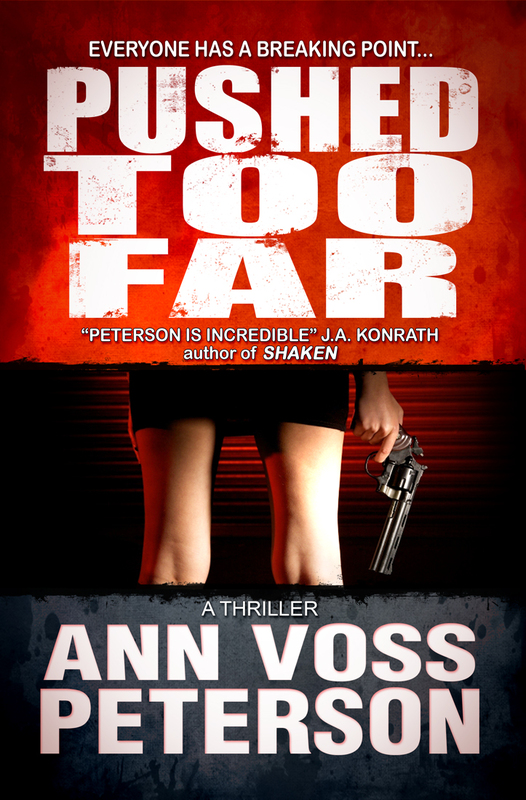 Her terrific self-published ebook thriller, PUSHED TOO FAR, is going to be free for the next few days. Download a copy. You'll love it. Tell everyone you know to also download it. Retweet this, help me spread the word. I really want to see PUSHED TOO FAR rocket up the freebie list and hit the Top 100. Unfortunately, many authors aren't as brave as Ann. They won't give up a guaranteed paycheck, no matter how small, for the uncertain risk of going it alone. Even as hundreds of authors bemoan their treatment by Harlequin (the single biggest group who thank me for preaching about self-pubbing are romance authors), there are still newbie authors by the scores eager to sign with Harlequin because they don't know any better. Well, now they know. Link to this blog, post comments, post your own experience, make sure EVERYONE knows that earning 2.4% is unacceptable and that no author will take those miserable terms. 1. The royalty rates of the Big 6 are lousy. Yours are repulsive. Change them. Then backdate those changes and give all of your authors a nice, fat check. 2. Give out-of-print titles back to your authors. I just had a long conversation with a friend of mine (not Ann) whose publisher won't give him his rights back because they state even though they no longer sell the paper copies, they are still selling them in ebook format. WTF? If that's the case, why does every contract have an out of print clause? Show me an ebook that has ever gone out of print! I offered to pay my buddy's legal fees when he sues the hell out of those assholes, because he'll set the precedent that frees us all. 3. I'm no lawyer, but licensing rights to yourself and calling it a separate company doesn't seem kosher. I have no horse in this particular race, but I urge those with horses to do something about it. Harlequin isn't the only one to blame, here. They're a company, interested in making money, so naturally they try to get the best terms. But shame on the agents who vetted these pitiful, one-sided contracts and then encouraged their authors to accept them. You have consigned thousands of books to a monstrous, voracious black hole. Harlequin NEVER should have been allowed to wield this much power, to control this much of an industry. You could have stopped them, and helped your authors. You didn't. Hey, Amazon! Are you reading this? You want to corner the market on the biggest selling genre in the world? Start courting Harlequin writers. They're eager to jump the Harlequin ship. Offer them a lifeboat and you'll become the biggest romance publisher in the world. As for Ann? She and I just signed a three book deal with Amazon's Thomas & Mercer imprint for our CODENAME: CHANDLER series. Ann is going to do just fine. But Harlequin, and all you publishing pinheads who seriously believe you can continue to keep screwing authors--I'm counting the days you have left. There will be a mass exodus of authors leaving you. There will be civil lawsuits. And the DOJ is going to--rightfully--crucify you yahoos, as laid out in this terrific post by Kris Rusch. If you are a publisher, be afraid. Be very afraid. If you are an author, share your stories here, warn each other, and band together. There is strength in numbers, and this revolution is about to draw blood.